Singer Mbosso seems to be doing quite well after being signed under Wasafi records. 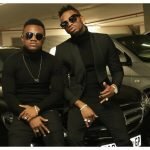 Well, after Yamoto Band split up, the singer got a chance to work with Diamond Platnumz and from the look of things, he is doing way better now. Just like Harmonize and Rayvanny – singer Mbosso has joined the league of singers who own their own properties thanks to their hard work. Through his Instagram page the singer shared a couple of photos and videos flaunting his new home. View this post on Instagram EXCLUSIVE VIDEO : Hii ndio nyumba mpya ya msanii wa WCB, @mbosso_ aliyoimiliki kupitia muziki | Nyumba hii iko maeneo ya Tegeta Wazo, Dar es salaam | Hivi karibuni tutakuonesha picha za ndani ya nyumba yake | Congratulations Mbosso A post shared by Mseto East Africa  (@msetoeastafrica) on Mar 31, 2019 at 9:53am PDT Wasafi’s star Judging from the number of hit songs Mbosso has been dropping since joining Wasafi proves that he could be the new WCB’s star. Anyway check out photos of his house below. The post Boss moves! ‘Hodari wa mapenzi’ hit maker shows off his multimillion house appeared first on Ghafla! Kenya.